Right now, Ellis isn’t really the best rookie out there (in terms of numbers at least). Heck, one might even argue he’s not the most explosive (Calvin Abueva anyone?) or athletic (read: Cliff Hodge), but Ellis definitely has the tools to be a consistent impact-player in the future. Perhaps not even just for the Kings, but for the National Team, too. also one of the top overall players? After seeing the replay of his nifty reverse dunk, I went to PBA-Online and checked who, actually, the top rookies currently are. Ellis is right up there, bunched up really close with Global Port’s dynamic young duo of Vic Manuel and Jason Deutchman. They’re a little behind Meralco’s Cliff Hodge, who was Ellis’s teammate on the SInag Pilipinas team last year, but the current runaway leader is Alaska’s Calvin Abueva. What’s more impressive is Abueva playing just about as many minutes as Ellis. Of these five guys, Hodge logs in the most minutes with more than 31 per game, while Manuel plays the least at just a shade above 20. One day Ellis might catch up with Abueva. He might even get ahead, but, right now, he’s still some ways off. With a bit more playing time and a bit more touches, he should make the jump. In the meantime, we, along with the millions and millions of Ginebra fans, will just have to be content with his occasional high-flying act. Arwind Santos scored 21 points and grabbed 12 rebounds to lead the surging Petron Blaze Boosters to a road victory over the Barako Bull Energy Colas, 93-83, Saturday in Lucena City. The Boosters annexed their third straight game to get back to an even .500 win-loss record at 6-6, good for a tie for sixth and seventh places with Ginebra. Barako Bull was still up, 55-51, early in the third quarter when a three-pointer by Marcio Lassiter kicked off a 15-2 run that allowed Petron to take the lead for good. The Boosters entered the fourth quarter with a 68-62 advantage and continued the onslaught, scoring the first 10 points of the payoff period to take a commanding 16-point lead. 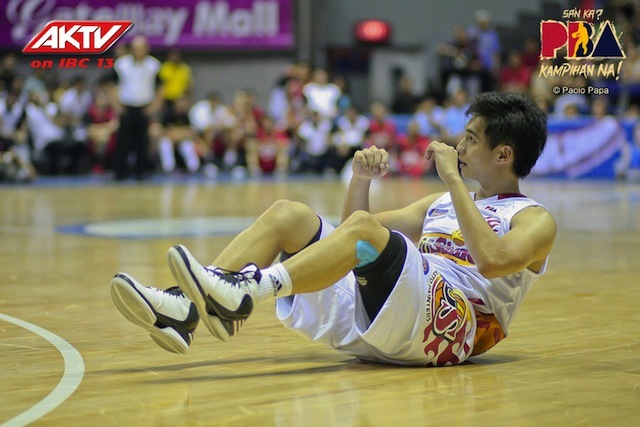 Barako Bull cut the lead to just 10 points, 82-72, but Alex Cabagnot kept the Energy Colas at bay with a four-point play that broke the rally. Doug Kramer carried the fight with 15 points and 21 rebounds for Barako Bull, which suffered its third straight loss to remain in ninth place in the standings with a 3-8 record. 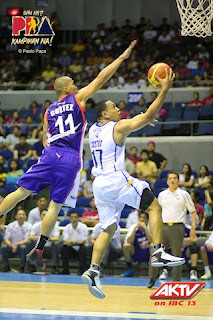 PET 93 – Santos 21, Lutz 12, Washington 12, Cabagnot 11, Lassiter 11, Yeo 10, Faundo 4, Duncil 4, Miranda 4. 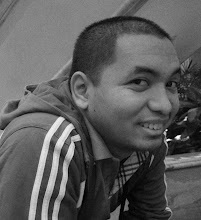 BAR 83 – Seigle 16, Kramer 15, Yap 15, Anthony 12, Pennisi 8, Najorda 6, Urbiztondo 5, Tubid 3, Co 3, Ballesteros 0, Cruz 0. Talk ‘N Text assured itself of a playoff for an automatic semifinal seat after nipping Air21, 100-94, in the 2013 PBA Philippine Cup Sunday at the SMART-Araneta Coliseum. The Tropang Texters needed big plays down the stretch to deny the Express from coming back in the game. They booked at least a tie for one of the top two spots with a league-leading 10-2 win-loss mark. The first and second place qualifiers enjoy twice-to-beat advantage in the quarterfinals. Jimmy Alapag fired 18 points and dished out six assists while Jayson Castro and Ranidel de Ocampo each had 16 points for the defending champions, who were challenged by the pesky Air 21 side to the hilt. 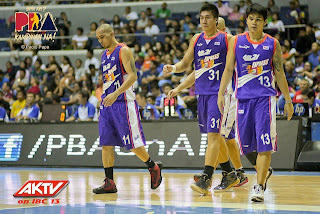 “Credit to Air21. They played us tough,” said Talk ‘N Text coach Norman Black, who sent the Express to their third straight loss for a 4-8 mark. Mike Cortez paced Air 21 with 23 points to go along with his nine rebounds, while James Sena and Nino Canaleta added 18 and 13 points, respectively. Cortez, Canaleta and Sena were responsible for keeping the Express in the game, combining for 19 points in the third quarter as they trailed by just one point, 70-69, entering the fourth quarter. They even took the lead at 75-74 on Sena’s basket before Talk ‘N Text responded with an 8-2 assault to take an 82-77 spread. 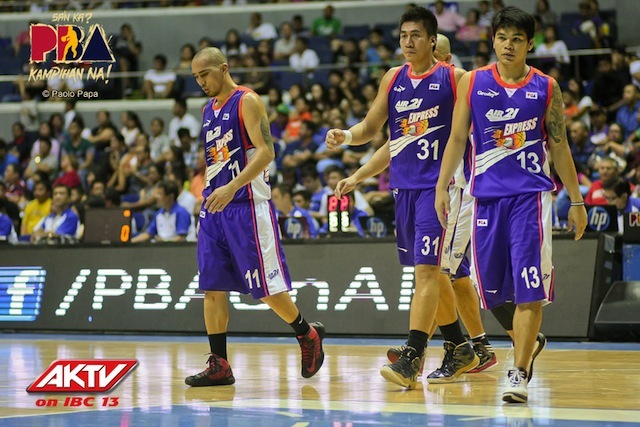 Renren Ritualo’s three-pointer pushed Air 21 within three points, 88-85. But Kelly Williams hit two free throws and Alapag hit a decisive three-poiinter for a 93-85 cushion with 3:47 remaining to take the game for good. “Jimmy came into the game with a lot of energy. He’s just being himself tonight,” said Black. TNT 100 – Alapag 18, Castro 16, De Ocampo 16, Fonacier 11, Williams 9, Peek 9, Dillinger 8, Carey 8, Reyes 2, Aban 2, Alvarez 1. A21 94 – Cortez 23, Sena 18, Canaleta 13, Isip 9, Arboleda 8, Ritualo 7, Custodio 6, Atkins 4, Reyes 4, Omolon 2, Baclao 0. Barangay Ginebra San Miguel unleashed its never-say-die spirit and turned back Rain or Shine, 97-90, to extend its winning streak to four games in the 2013 PBA Philippine Cup Sunday at the SMART-Araneta Coliseum. The Gin Kings crawled back from a 17-point deficit midway through the third quarter, holding the Elasto Painters to just one field goal in the final 2:33 to join Meralco in fourth place with a 6-5 win-loss mark. LA Tenorio dished out a near triple-double performance with 20 points, seven rebounds and 10 assists and piloted Ginebra’s rally in the fourth quarter. 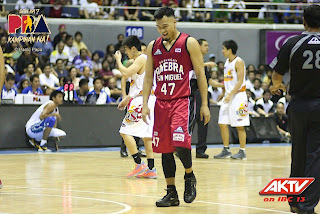 Mark Caguioa added 18 points, though he was not around when the Kings made the run. Rookie Chris Ellis chipped in 15 points and punctuated their team’s victory with a reverse windmill dunk that pegged the final score. “We came out really flat. The good thing, we stuck together and got through this one,” said Ginebra coach Siot Tanquingcen, who also drew 12 points from Billy Mamaril. Jayjay Helterbrand came off the bench and contributed six points, seven rebounds and five assists while rookie Yousef Taha also provided quality minutes in the fourth period with his hustle plays on defense. Rain or Shine, which dropped to third place with a 8-4 mark, led by 15 at the half, 57-42, and was still in control after TY Tang hit a triple to start the final quarter for a 78-69 lead. 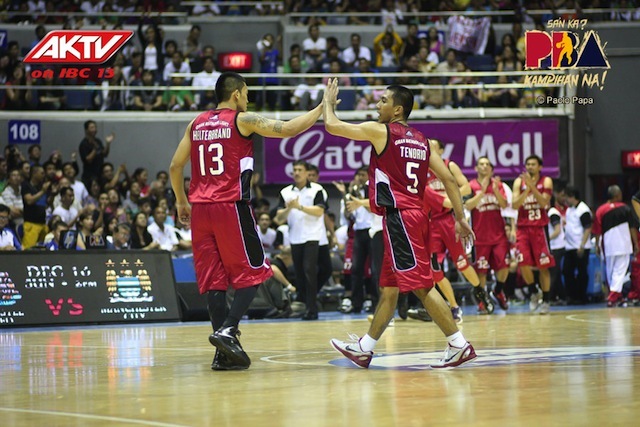 But Tenorio anchored a momentum-swinging 14-8 exchange he capped with a three-pointer to close in at 86-83 with 2:53 remaining. Jeff Chan push the Rain or Shine to five points, 88-83, with a running jumper with 2:33 left in the game. But the Gin Kings unloaded 10-0 blast to take a 93-88 lead with just 16.7 seconds left. JR Quinahan ended Rain or Shine’s drought with an undergoal stab but time was not on their side, allowing Ginebra to pull off another escape act. 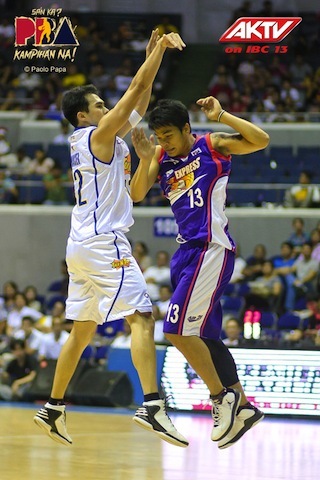 Jervy Cruz led the Elasto Painters with 17 points and 12 rebounds and was 13-of-13 from the free throw line. Larry Rodriguez added 14 points, while rookie Chris Tiu returned from injury and contributed eight. GIN 97 – Tenorio 20, Caguioa 18, Ellis 15, Mamaril 12, Wilson 9, Maierhofer 7, Helterbrand 6, Taha 4, Espiritu 2, Raymundo 2, Hatfield 2, Labagala 0. ROS 90 – Cruz 17, Rodriguez 14, Tang 12, Chan 11, Quinahan 10, Tiu 8, Arana 8, Belga 7, Matias 3, Norwood 0. 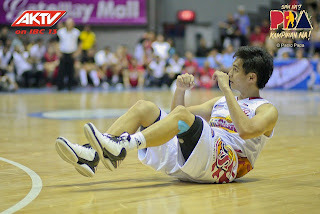 Chris Tiu and the Painters feel flat in the fourth quarter. the Kings rallied to beat ROS. 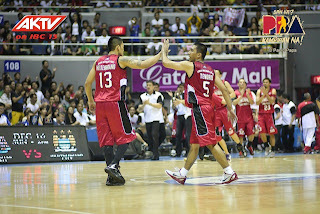 to be good as Ginebra pulled out a big win.